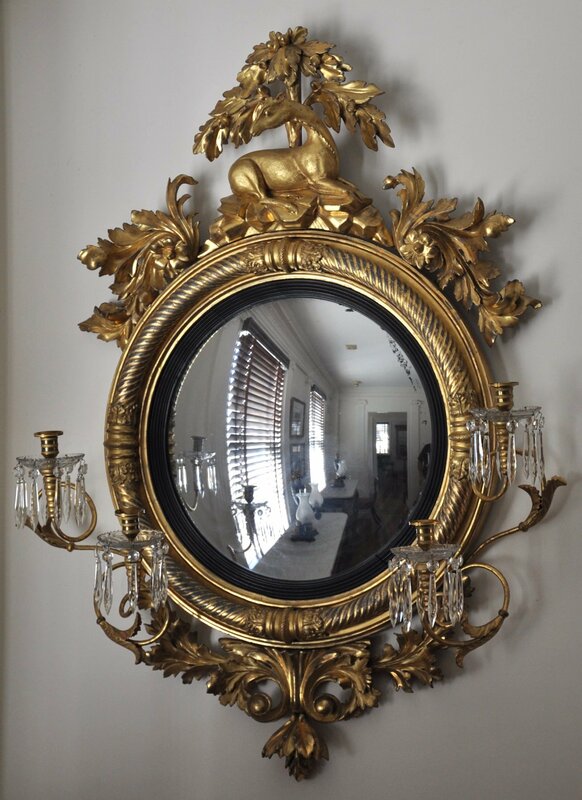 This is one of a pair of beautiful girandole mirrors that exemplify the best of the form. Each is topped by an opposing deer sitting on a formation of rocks underneath the canopy of a tree. Carved acanthus leaves decorate the edges of the frame. Four scrolling candle arms terminate with gilt-lacquered brass candle cups and bobeches above glass drip pans and prisms. The convex mirror plates are surrounded by ebonized liners. Beneath the excellent gilding, a gray boulle can be seen which is generally associated with mirrors made in America. Reference: The mirrors were included in Very Rich & Handsome, an American Neo-Classical decorative arts exhibition curated by father-daughter team Stuart P. Feld and Elizabeth Feld, Hirschl & Adler Galleries, Inc, page 95, in 2014 and before that in the Hirschl & Adler exhibition The World of Duncan Phyfe, page 39 in 2012.